The Ultimate Goal - Stratford 2010 - What Is The Ultimate Goal? One of the world's biggest parties is occurring this year in South Africa - it is the football world cup. In two years, 2012, the absolutely biggest mega global sport extravaganza on this planet: - the Olympics is coming to Stratford. So the big question is are we going to be a part of it and make a significant contribution to the greatest of occasions or instead be party poopers? The churches in Stratford want to make the most of the opportunities in the lead up to the Olympics and to be ready for this once in a life time opportunity in 2012. The excitement of the build up towards the 2010 World cup provides us a chance to experiment and in a sense have a trial run. How effective can we be in working together and inviting people in to join in the party? 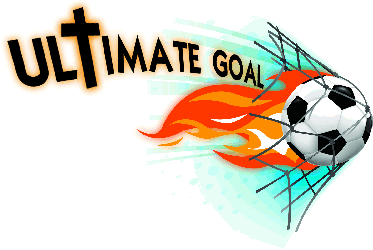 So we plan to hold a festival called the "Ultimate Goal" from the 5-13 June 2010. At this festival the churches are seeking to demonstrate , through hospitality and acts of kindness, and communicate, through exciting and dynamic presentations, the love of God. 18 churches have been involved in preparing and praying over the last year for the forthcoming Ultimate Goal festival. Anglican, Baptist, Methodist, Salvation Army, Pentecostal, Evangelical, Independent, New churches in partnership together proclaiming "Ultimate Goal"
The churches have teamed up with 'Through Faith Missions' an agency that has much experience in communicating the Christian message throughout the UK during the last 30 years. Roger Murphy will be leading a team of 20 volunteers who will come and help the Stratford churches be effective in reaching out to the community during the festival. Roger has a life story that particularly enables him to engage with and identify with those who do not attend church and has had the privilege of seeing many people come to faith. Each church is being encouraged to play to their strengths in putting on events and activities which all leads to an incredibly varied programme over the week. With the World Cup serving as a back drop some of the festival will have a football theme however there will be plenty of alternatives for those seeking to escape the hullabaloo. Currently plans being discussed include: concerts, a big screen event televising the England game, a sport's event, a youth night, a dads and sons night, a jazz café, a healing café, and many many more. This is a real opportunity and is very worthwhile if it was on it's own for 2010 but it also stands us in good stead for the really big one in 2012 where the opportunities will be endless!